TOKYO – August 13, 2018 – LINE Corporation announces that it will be making improvements to the LINE messaging app’s profile page in the coming days. * The release schedule will be announced in the official LINE blog once it is determined. 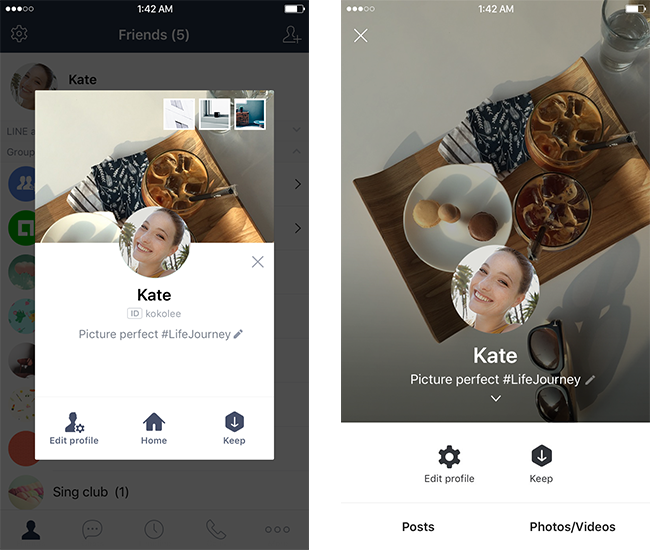 Because the profile page is the front cover of a user's account, LINE has been continuously dressing it up with new features, enabling users to set a profile video, background music, and more. As a result, the profile page has grown to become a popular place for users to express themselves, their mood, and share their recent activities through their profile images and videos, background music, and status messages. Younger users in particular are trending to make use of their profile page as a place to not only display their name, but also actively communicate with their friends through their profile details and status message. LINE’s latest decision to revamp the profile page is in reaction to the recent phenomenon of users actively using their LINE profile page and communicating more and more through images and videos over the years. First, the update will enlarge the cover image to a more smartphone-friendly display size, and rotate it from landscape to portrait-mode.（*2） Next, the profile icon will be displayed in the center, along with the user's display name, status message, and background music. *2 While the cover image size will generally be 720 by 1280 pixels following the update, the display area may slightly differ depending on each device’s screen size and image resolution. Furthermore, whereas users are currently required to tap on Home (indicated by a house icon) in their profile page to view their Timeline post history, following the update, their old Timeline posts will be displayed simply by scrolling in the lower area of their profile page. Users can also tap "Photos/Videos" towards the bottom of their profile page to see all of the images, videos, and GIF files they posted to Timeline in and after 2017. Users can continue to access the chat, free voice call, and video call features from their profile page after the update.